“The State of the Nation’s Housing 2015,” the report published last week by Harvard’s Joint Center for Housing Studies, has already garnered a lot of attention. We wrote about how it points to a new “gerontrification” of homeownership, with all the growth in non-renter households predicted to come from the 65+ age range; Emily Badger focused on the rising popularity of renting among all age groups; and so on. But before the urbanist news cycle moves on completely, we wanted to point out three more takeaways from the long, data-rich report that we hope don’t get lost. 1. There is a national shortage of rental housing that’s pushing prices higher. The shift to renting has led to competition over scarce apartments (and for-rent single family homes) – even as production of rental properties has picked up. JCHS reports that the national vacancy rate fell to a nearly 20-year low of 7.6% in 2014, pushing rents up by 3.4% in the same year, or twice inflation. What’s more, the rental market might be about to get another shock of demand as the economy improves and young adults who had been living with their parents decide to move out. While the demand for apartment living isn’t evenly spread around the country, the fact that there is now a clear shortage of rental housing nationwide ought to suggest even more strongly that places where demand is most concentrated need to step up and provide the housing that people want to live in. Of course, something close to the opposite is happening: cities like San Francisco are allowing very little new housing, rental or otherwise, exacerbating their own housing crises. 2. In many communities with high concentrations of low-income households and people of color, home prices are still too low. The financial crisis and collapse of the housing market struck a terrible blow to Americans’ household wealth – a blow that was felt most acutely by people with low incomes and people of color. As an excellent Washington Post series catalogued earlier this year, by 2013 the median black household held just $11,000 in net assets – half of which was in housing – while the median white household held $134,000. The JCHS report finds that “in about a tenth of the nation’s zip codes…, [home] prices are still more than 35% below peak,” and more than one in four homeowners in those neighborhoods is still underwater on their mortgage. In more than half of those zip codes, people of color make up the majority of residents. 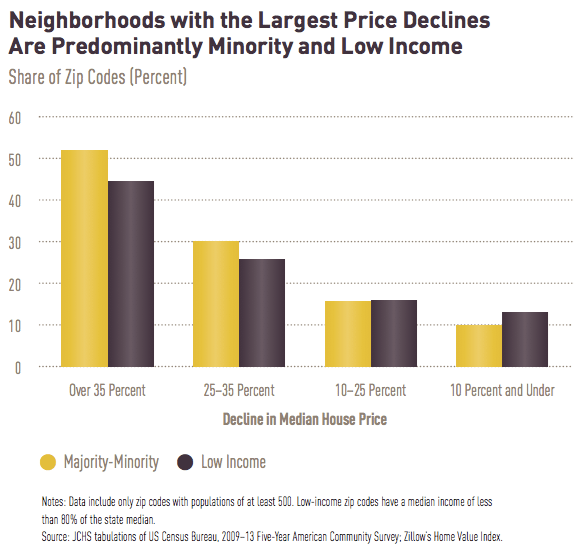 Of zip codes where home prices have risen – or fallen by no more than 10% since their pre-crisis peak – only 10% are predominantly minority. 3. More than two million subsidized affordable homes are set to lose their subsidies in the next ten years. Many affordable housing programs – including the largest, the Low Income Housing Tax Credit, or LIHTC – create subsidies with expiration dates. Over the next ten years, 1.2 million LIHTC homes, and about a million homes subsidized by other programs, are set to return to prevailing market prices – usually far above what’s affordable to the very low income populations they serve. That puts many American cities in the unenviable position of trying to grow their stock of affordable housing even as their existing affordable housing starts to disappear. Over the next decade and beyond, how to solve this Sisyphean problem will have to be a major part of the housing policy debate. At City Observatory, we certainly don’t think we have a solution yet – but we’d like to see more attention brought to the issue.